Not so long ago, a mutual friend asked us, “Why do you climb mountains? You risk life and limb, waste money, and subject yourself to exhaustion just to be at the summit for a few minutes.” He has a point. Climbing mountains can be dangerous, considering we are constantly exposed to the merciless elements of Mother Nature; a single, simple mistake can cost us dearly. We sacrifice to save money and spend a lot of cash for gears, transportation, food, and logistics just to climb peaks when we could have saved that money for a car, house, etc. We tire ourselves out, suffer cramps, sweat in the heat, or shiver in the cold to reach the top. We get no money out of our sacrifices. Yet, we find that what we do is all worth it—and so much more. By climbing mountains, we find true solace, serenity, and happiness from a cruel, chaotic world. We give ourselves a chance to defy our limits, using our creativity, skills, determination and, sometimes, stubbornness to push our way. We get to meet new friends, learn new things, and experience something new. We get to face our fears and expose ourselves to danger, allowing us to humble down and put ourselves back to our rightful place. We get to witness stunning views of valleys and skies, see how ecosystems work, and discover the unusual; those are events and things that not everyone has a chance to see. We believe that all the experiences, learning, and rewards that we gain by climbing mountains are all worth the risks and sacrifices we take. Climbing the mighty Mt. 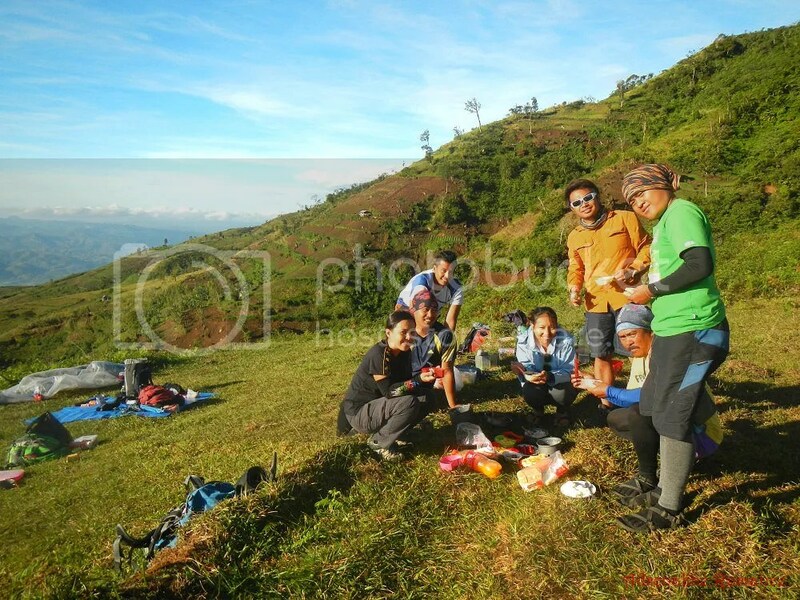 Kanlaon was another great opportunity for us to experience life as we enjoy it. And the first day of the climb was just a sample of that experience. Following an extremely frigid night, we woke up to a still frigid dawn. However, no amount of coldness can freeze the warmth and the gleam of a new day, a sign of new hope and energy. 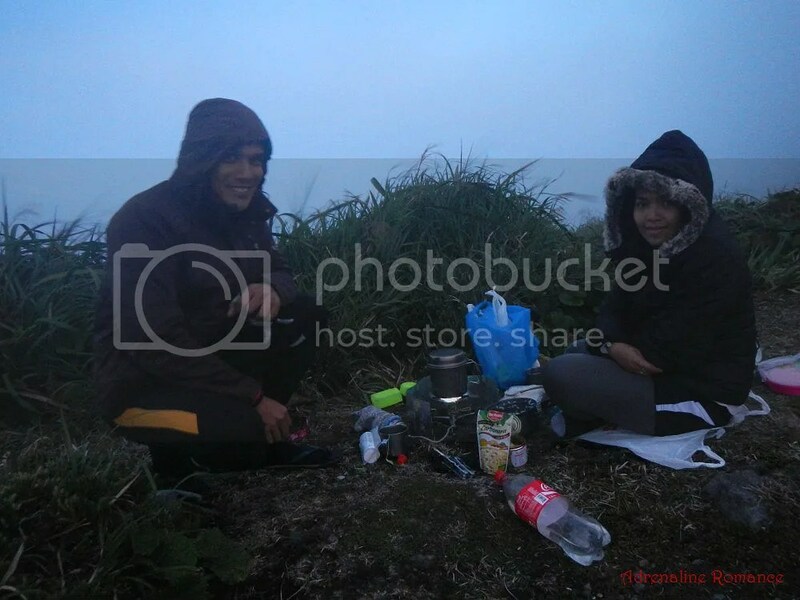 While watching the sunrise, Sweetie and I boiled some water to make hot coffee. In the mountains, coffee is an absolute must (notice the redundancy) for many mountaineers! There’s nothing better to stave off the extreme chill by sipping hot coffee. 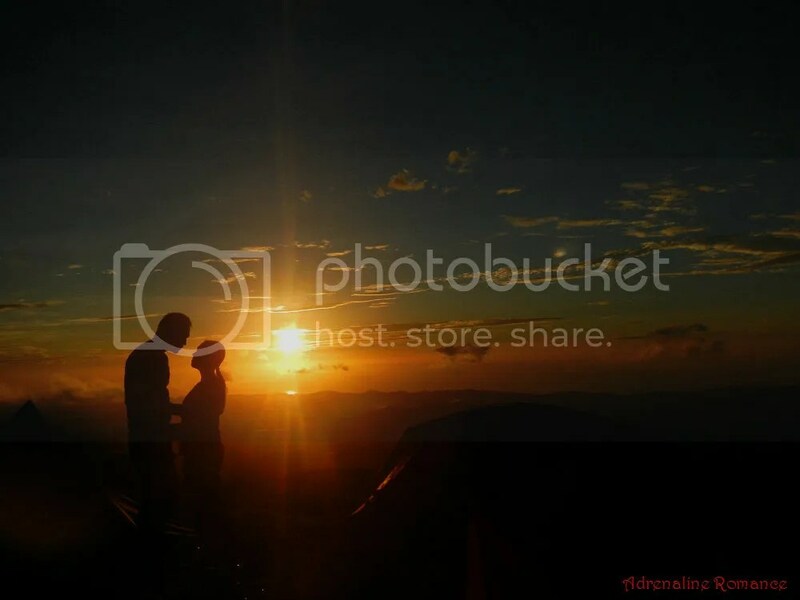 And it gets even better when you’re drinking coffee at dawn on the slopes of a mountain with a special someone! As the sun rose higher, the temperature rose until it was warm enough that we can take off our cold-weather gear. After enjoying the glorious Mt. 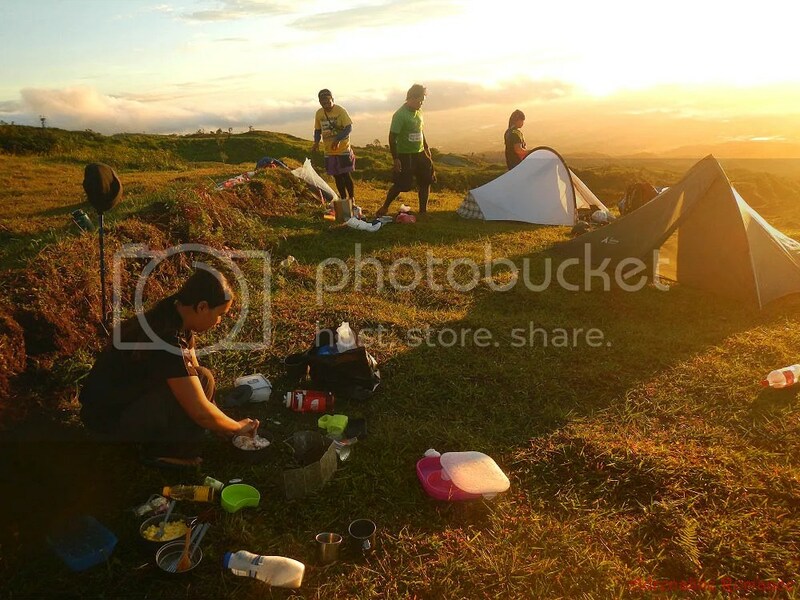 Kanlaon sunrise, we prepared a huge breakfast; we need lots of energy for a demanding trek today. We also prepared and packed our lunch; we’re going to take our lunch en route to Mt. Kanlaon’s Eastern saddle. After 45 minutes, a delicious breakfast was set on the grass. 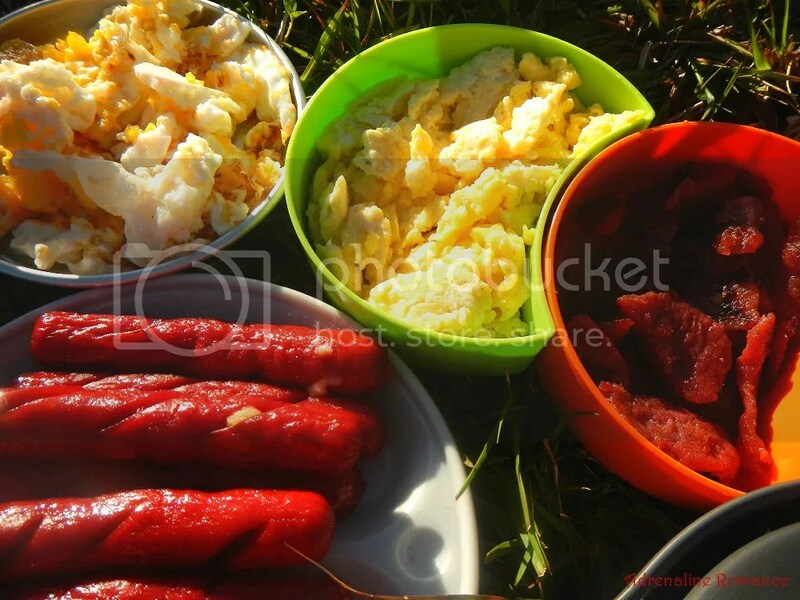 Eggs, tocino, hotdogs, dried fish—just our kind of breakfast. Attack the food! Actually, there was plenty for everyone despite the seemingly small serving you see in the photo below. It was time to break camp, clean up, and pack up after breakfast. We also filled up our bottles with drinkable water; the water source at the Mapot base camp is the last water source where we are assured of clean, drinking water. The water in the next source in Kutitap, which is hours away, is still clean and can be used for cooking but somewhat unsafe for drinking. While packing our gear into our packs, we chanced upon this nice lenticular cloud over the mountain. Lenticular cloud formations often look like gigantic flying saucers. Naturally, skeptics and researchers have cited lenticular clouds as explanation for several UFO sightings. A short prayer and a short briefing preceded our trek for the day. Then it was time to restart our climb. 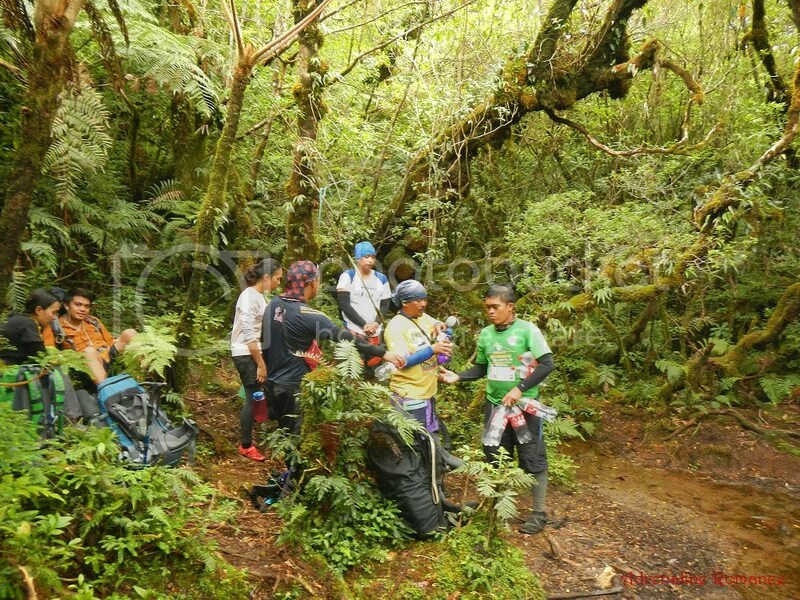 Our packs felt heavier than usual because we filled and carried several bottles of drinking water. That is in addition to the packed lunch we cooked earlier and our gear. Whew! After an hour of climbing under the increasingly hot sun, we felt relieved as we approached the lush treeline, which is a couple of hundred meters in altitude above the Mapot base camp that we left far behind. We can’t climb nonstop—hey, we’re also humans—so the team scheduled 5-minute rest stops for every hour of trekking. 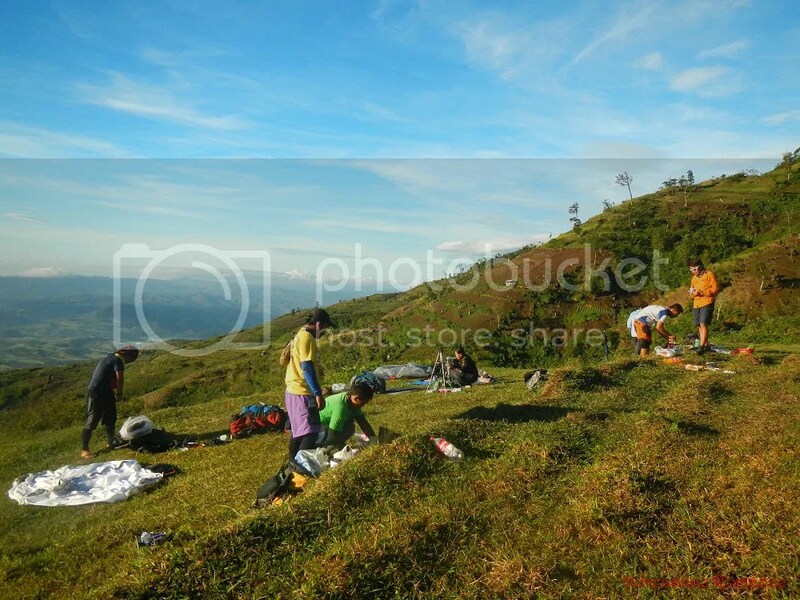 Here, the team rested at the very edge of a landslide brought about by the February 6, 2012 Visayas earthquake with its epicenter somewhere off the coast of Negros Oriental. After climbing for almost another hour, we finally reached the treeline. That means we were entering the shady forest, which was quite a relief after being exposed under the scorching morning sun for almost two hours. Due to its height, Mt. 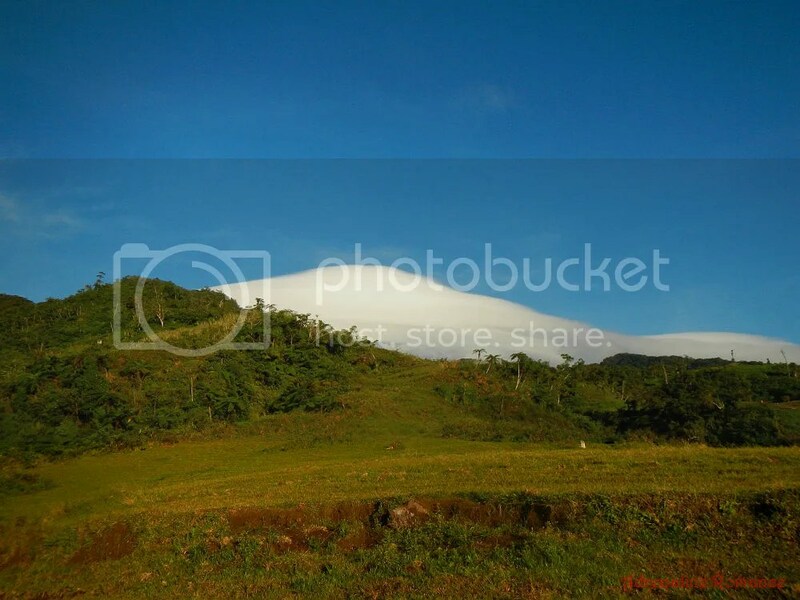 Kanlaon has its own microclimate. A microclimate refers to a localized atmospheric zone where the climate differs from the area surrounding that zone. 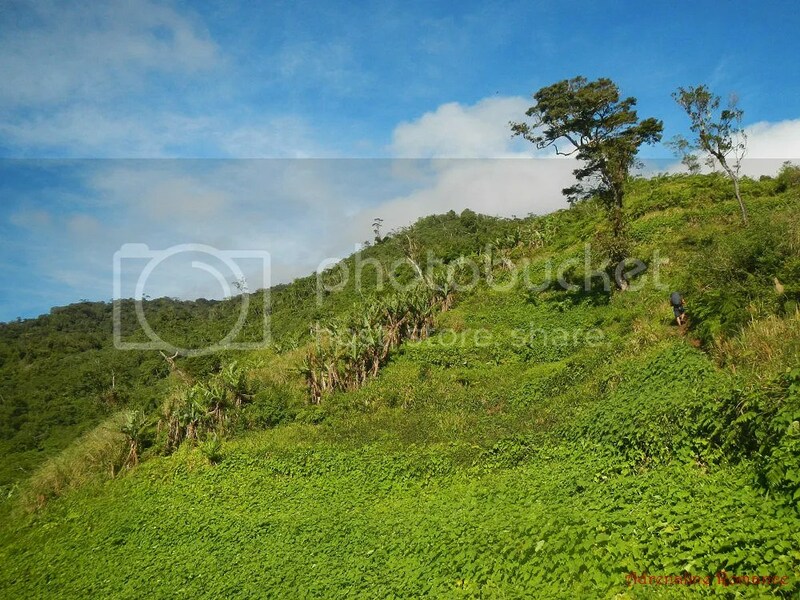 Because of the mountain’s microclimate, perennial rains and showers constantly bathe the forest even though the weather in the lowlands is sunny. That also means that the trail is somewhat muddy. 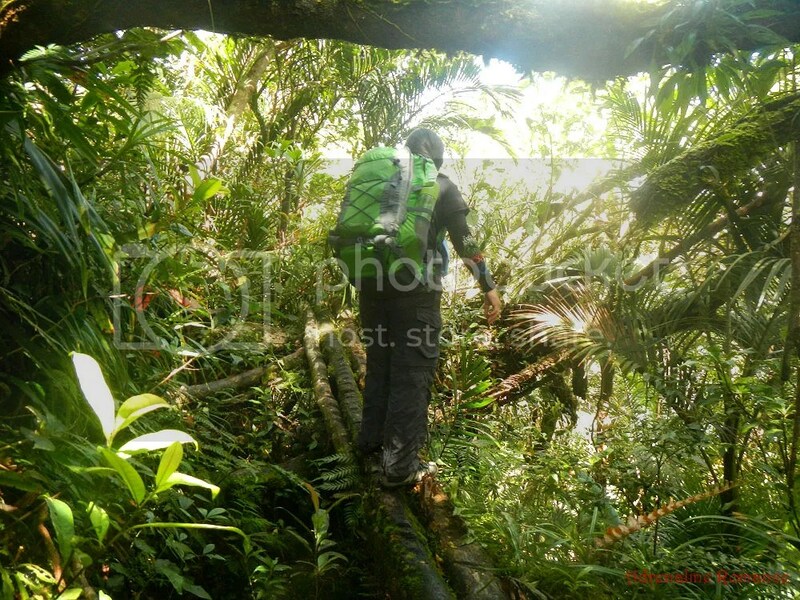 That really presented quite a challenge because we had to navigate steep ascents laden with soft, muddy soil. We couldn’t just hold tree trunks, roots, and other vegetation; many are either thorny or rotten inside. 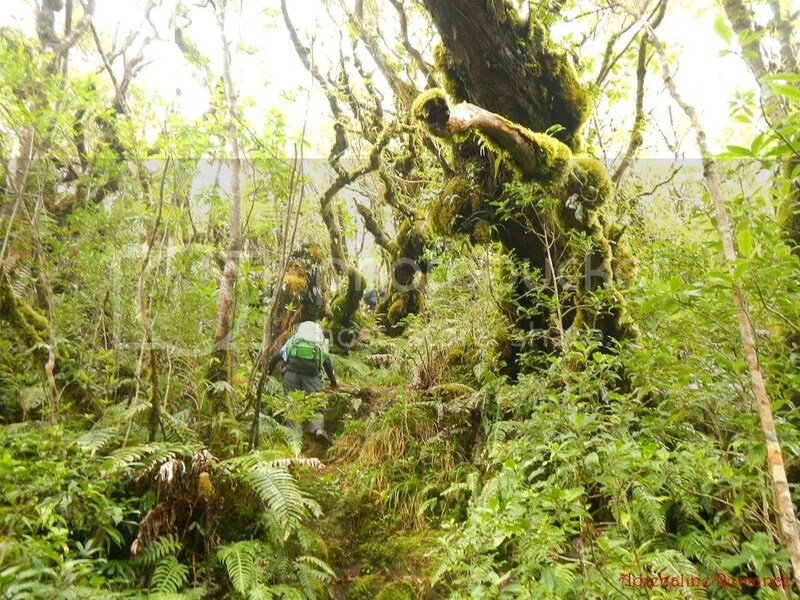 We went deeper into the lush, ancient forest. Check out the sky in the photo below; as you can see, it was quite sunny. However, the surrounding air was quite cool and comfortable, around 24 to 25 degrees from Sir Val’s Suunto Sports Watch thermometer. Also, the ground and vegetation were wet. 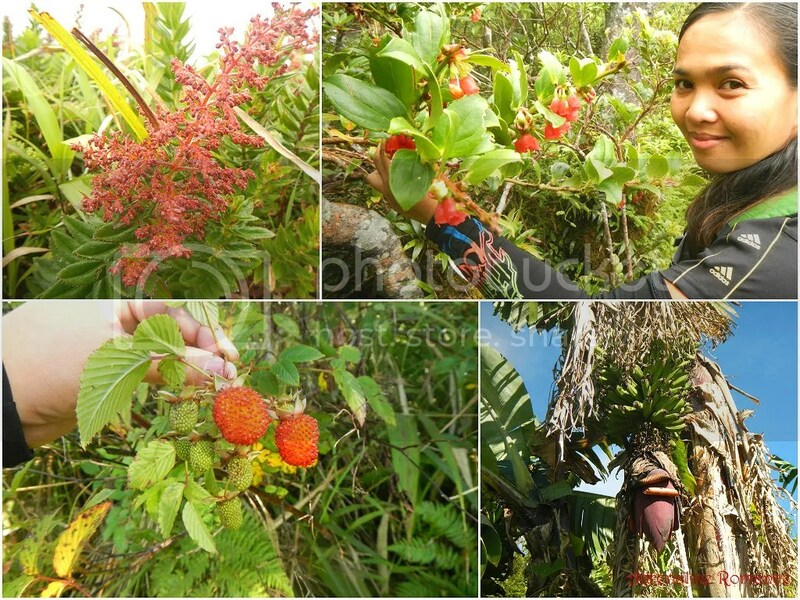 Wild berries, wild flowers, even wild bananas! 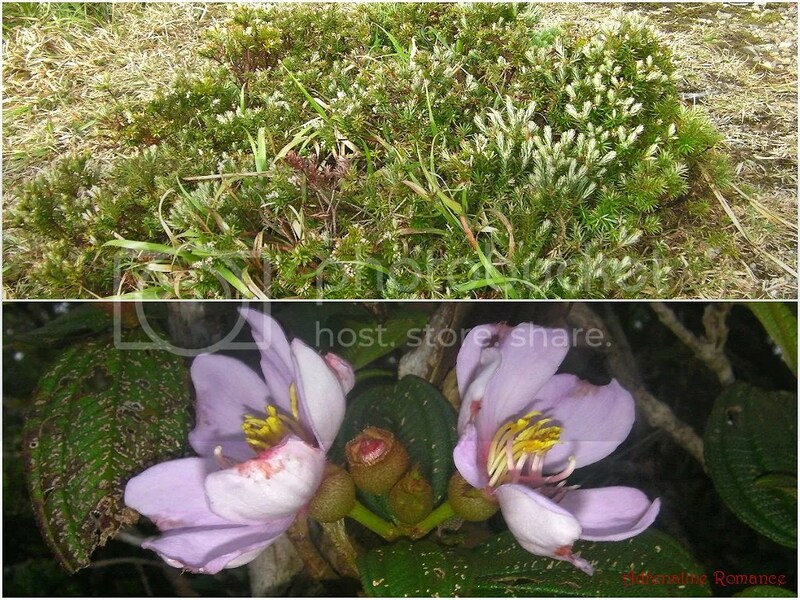 Those are just some of the plants we found in the slopes of Mt. Kanlaon. Be careful! Sweetie had to do a bit of balancing act to get through this “bridge.” It spans a narrow gap, with deep ravines on both sides. This is one of the things that we like about the forested Mapot Trail. It has a plethora of physical and mental challenges that await climbers who hunger for adventure. This flat, protected rest area deep in the jungle doubles as an emergency camp. 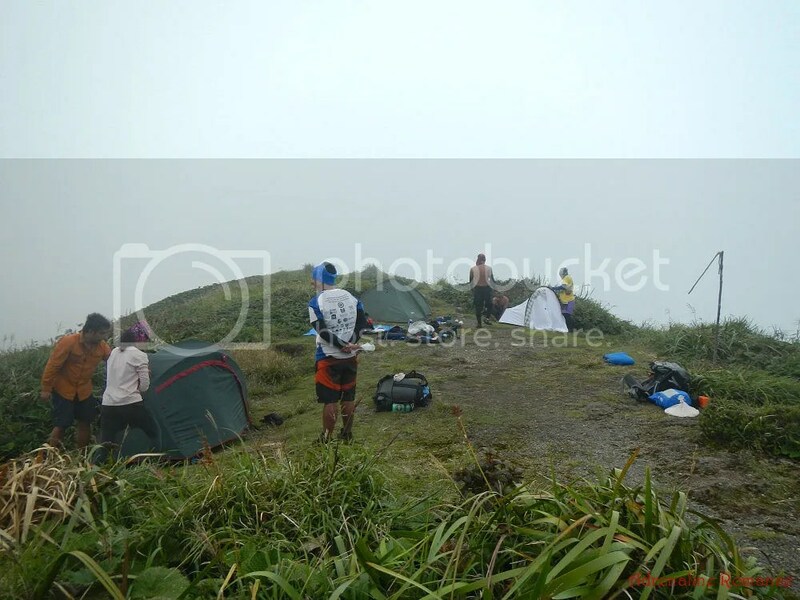 Climbers who attempt to reach the summit but fail to do so due to bad weather or because night befell on them can pitch their tents here in the emergency camp. How do you go through a tree that is blocking the trail? Plenty of ways, actually! Close to noon, we reached Kutitap, one of the oldest regions of the forest. It was here where we filled some of our bottles with water for cooking. Trivia: Is the place called Kutitap (Tagalog for “sparkle”) because fireflies light the place up at night? Is it because at some point during the day, something sparkles in there? Is it because of the sparkling water? Nope! According to Sir Tbong, it is named Kutitap because some years ago, a guide fastened a Kutitap Feeds sack on a branch as a sign that there’s a water source nearby. Of course, the sack has long been removed, but the name Kutitap lived on. After a short rest and filling our bottles, we proceeded to Makawiwili Peak where we plan to take lunch. 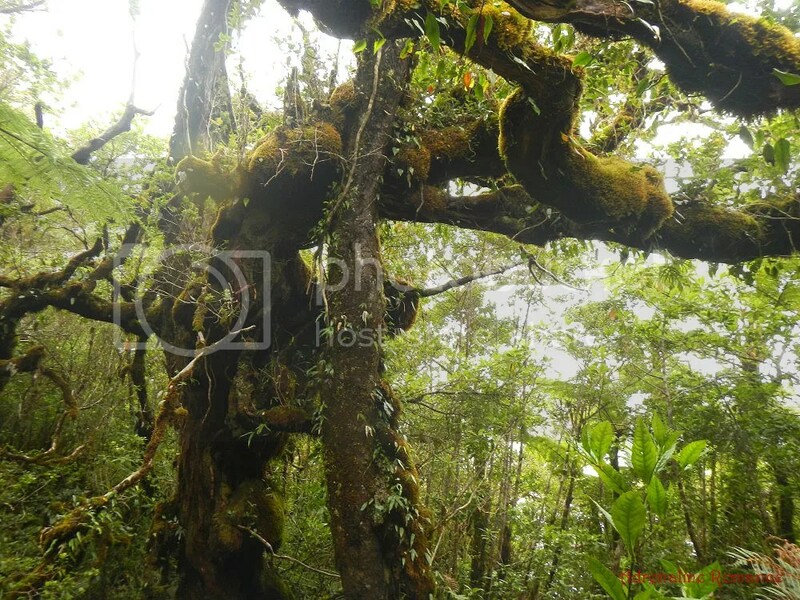 Along the way, we witnessed ancient trees that form the canopy of Mt. Kanlaon, common features in a dipterocarp forest. Many of the dipterocarp trees in the forest are covered with moist moss. The moss harbors numerous insects, worms, and other organisms. Thus, there is a complete ecosystem in just one ancient tree. Wow! 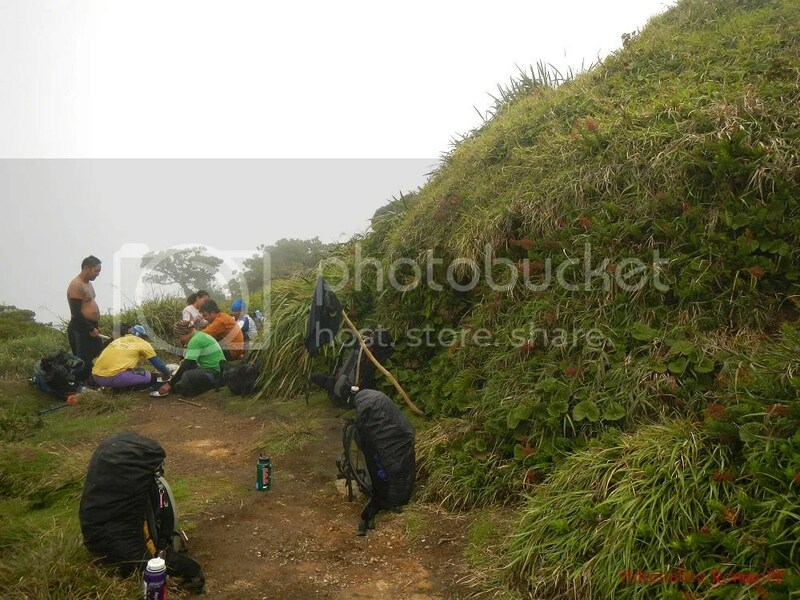 After another hour of climbing, we reached an area where cogon grass started to emerge. It was a good sign; that means, we’re near Makawiwili Peak—and a well-deserved, much-needed lunch break. 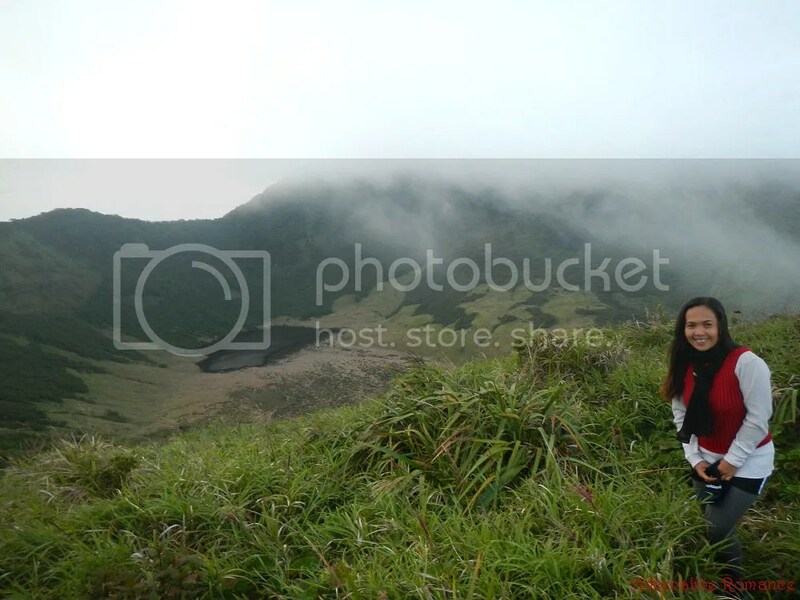 After 200 steps (at one point of the trail, Sir TBong said that it’s only 200 steps to the peak. Okay, some people really did count their steps. Hehehe! 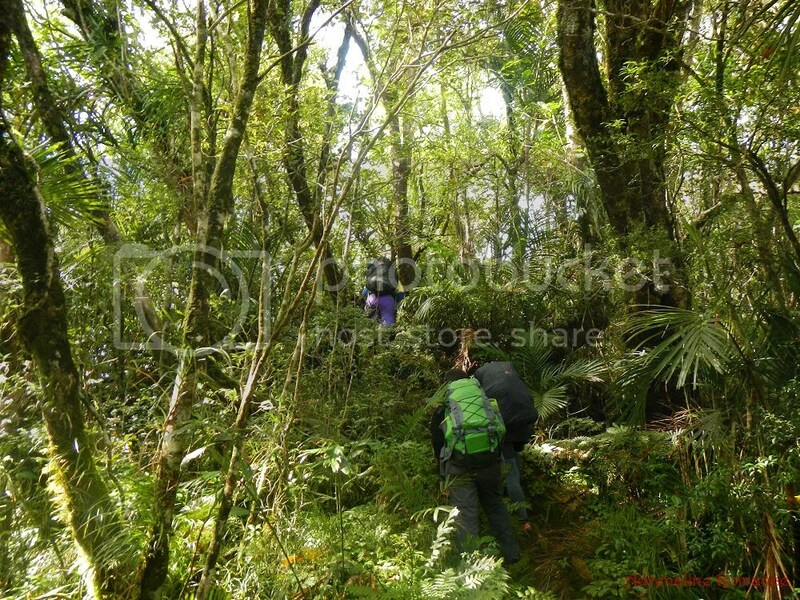 ), we finally reached Makawiwili Peak. 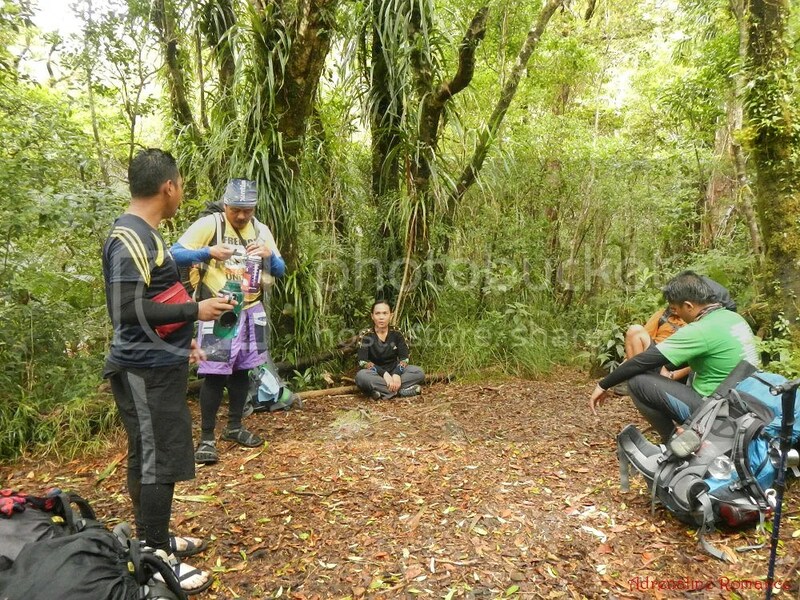 We simply dropped our packs from sheer exhaustion and took out our packed lunch, which we cooked earlier this morning. Lunch is served! Just look at our happy faces. 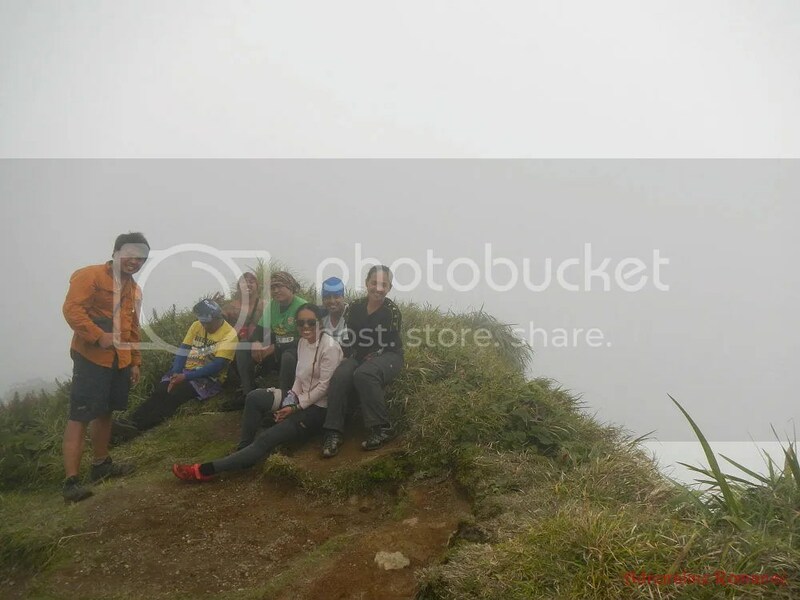 After lunch, we climbed up Makawiwili Peak to get a glimpse of the breathtaking Margaha Valley and Mt. Kanlaon’s cone. Unfortunately, heavy fog blanketed the area. We kept still and quiet in the hopes of getting a clear view; local legend mentions that the mountain god does not like noises and covers his majesty if climbers are boisterous and rowdy. But the fog stayed there for quite sometime. Notice, in the photo below, that we’re sitting a good distance away from the grassy edge. That’s because that edge is the lip of a cliff. It’s not safe to stand there because a strong gust of wind can push you over the edge. Also, the thick grass covers the actual lip of the cliff; what looks like strong ground may actually be flimsy grass. For safety, climbers must crawl (prone) at the edge of the cliff. At this vantage, the otherworldly Margaha Valley can be seen. Technically, that is not a valley, which we will explain in the next article. 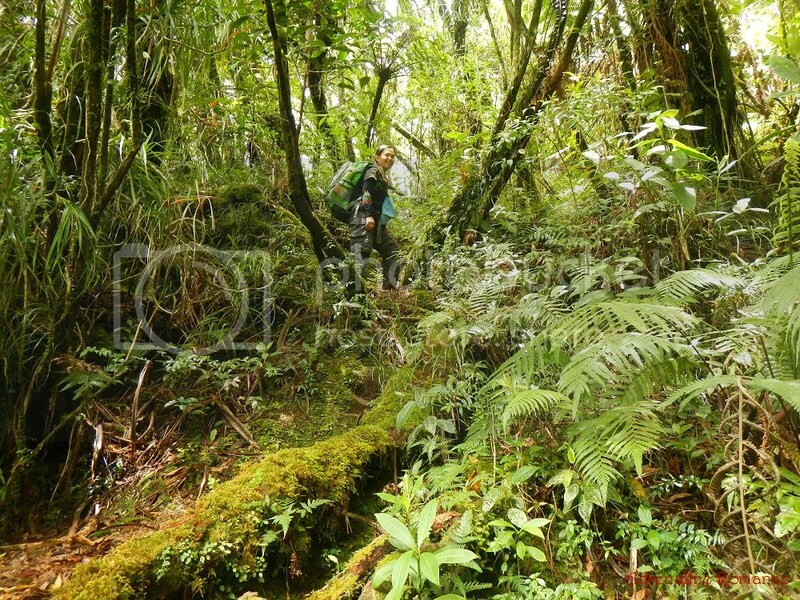 To get to our campsite, we have to walk along the lip of Margaha Valley. 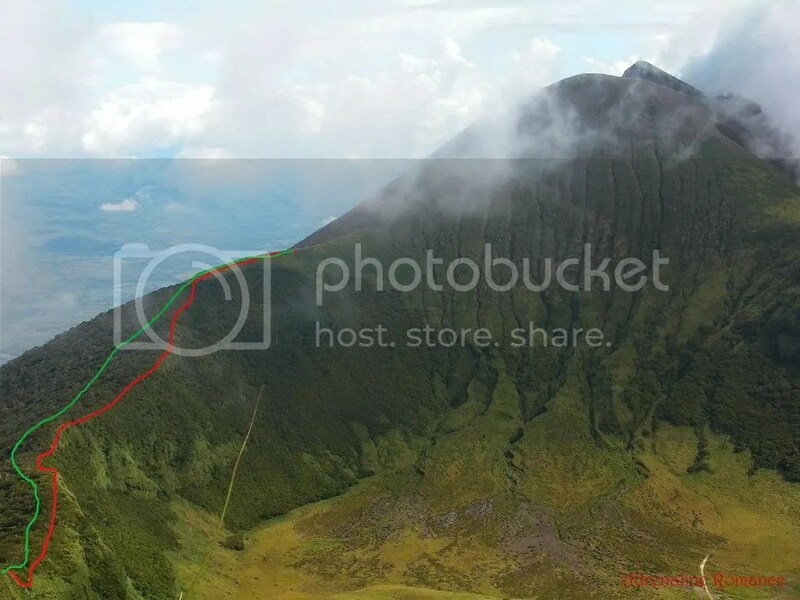 The original “Knife Edge” trail (red) runs along the very edge of the lip, following the actual contour of Margaha Valley. This is very dangerous as a misstep to the right can send the person careening over the edge. No one can survive the fall. Because of the danger, tourism officials have decided to close the trail. Today, we can take a safer route through the forest (green), running parallel to the Knife Edge trail, to the campsite. 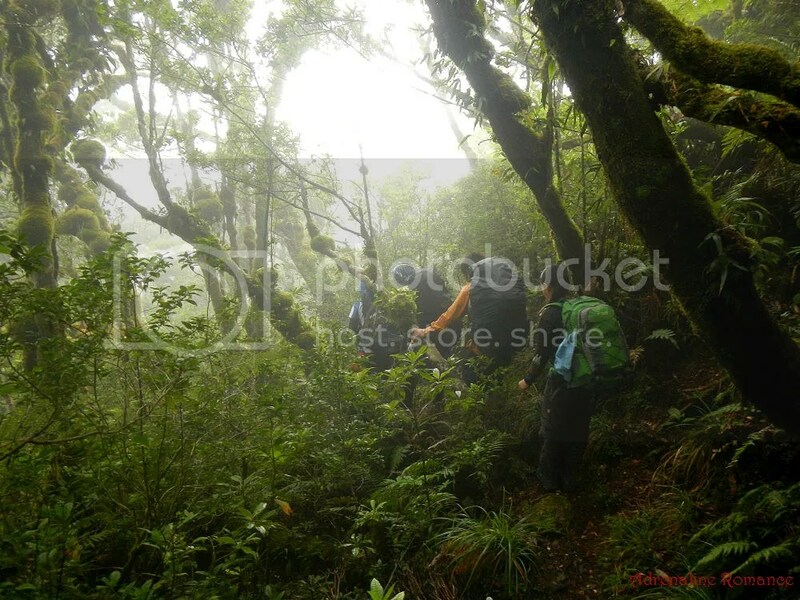 From Makawiwili Peak, it was a continuous, knee-shattering, treacherous 2-hour downhill trek to the Eastern Saddle. 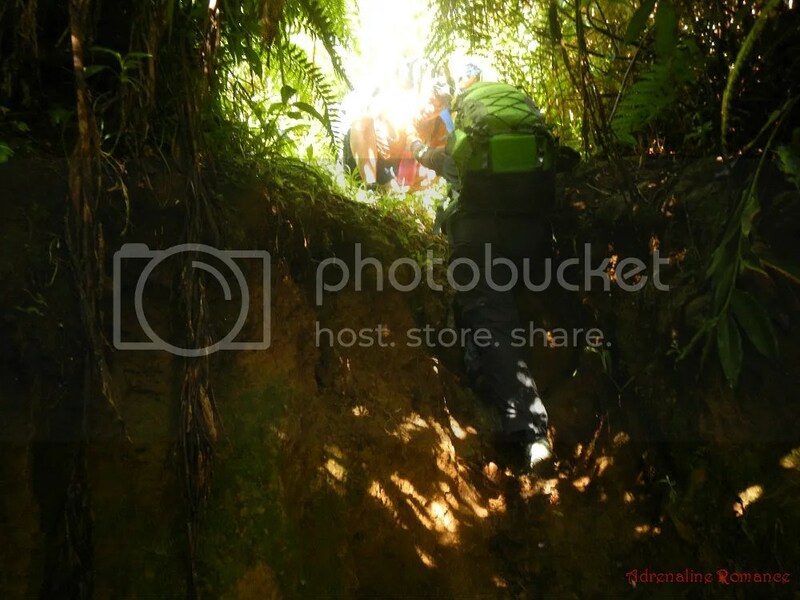 Many times, we had to descend nearly vertical trails, holding on to roots, branches, trunks, and rocks for support. The air in this part of the forest was cooler and wetter than that in Mapot. The foliage was noticeably older too. It was like journeying through Mt. Kanlaon’s forest’s history. Just check out that lush greenery, moss-covered trees, and giant ferns. This is virgin rainforest at its finest. About 90 percent of the trail consists of going downhill. In parts where the trail ascends or levels out, we were practically sighing in relief. 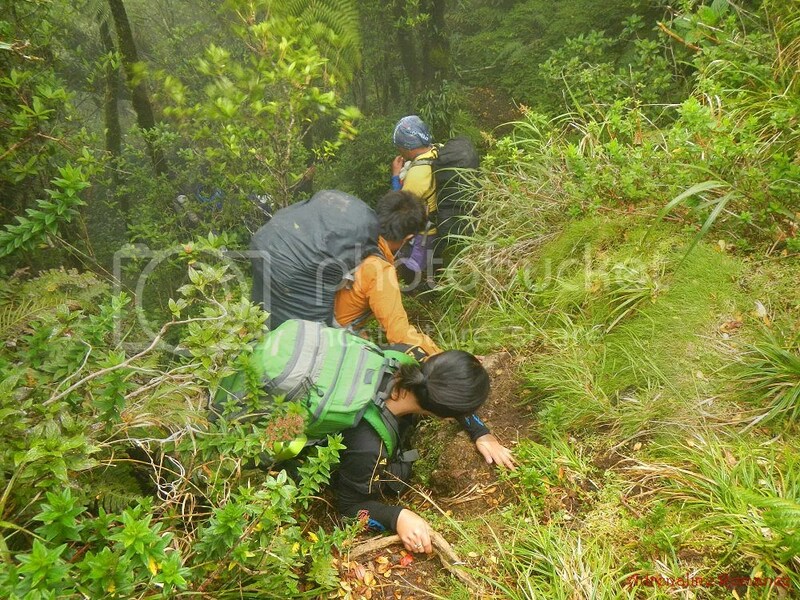 After more than an hour, the clean, vegetation-covered trail started to incline sharply. That was good news; it meant we were nearing the saddle. 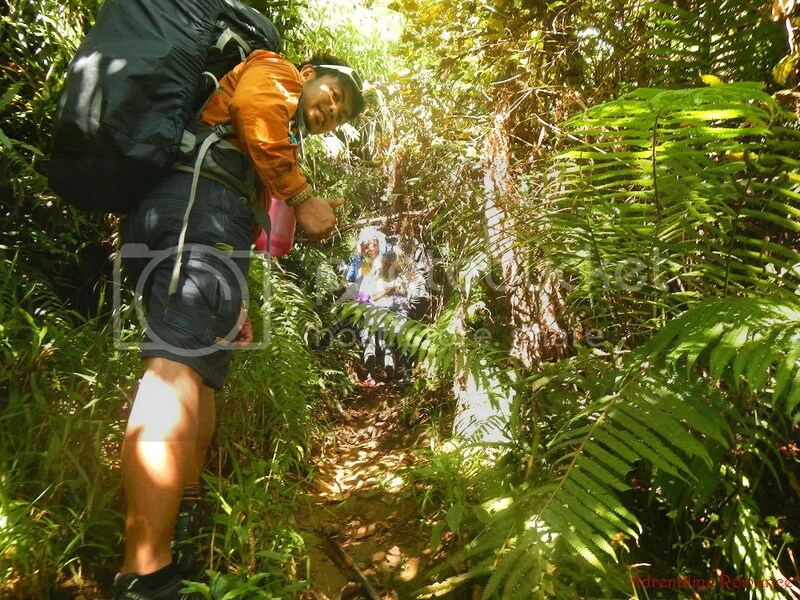 Again, the presence of cogon grass and low-lying vegetation assured us that our whole-day ordeal was almost over. We were totally exhausted from the grueling climb up Mapot and the equally grueling downhill trekking around Margaha Valley’s northern lip. All we could think about was reaching the saddle campsite, drop our packs, and lie down on the ground. Finally, after more than 6 hours of trekking and climbing, we finally made it out of the forest. 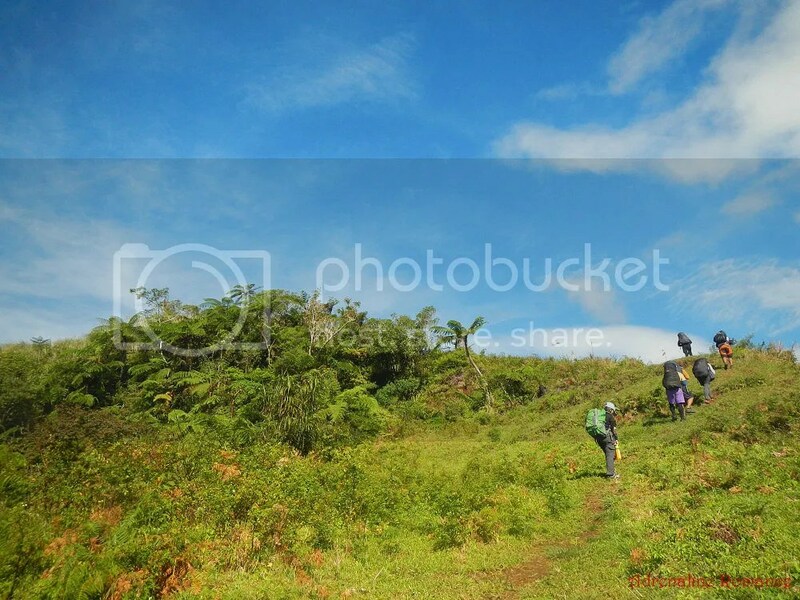 Leaving the treeline behind, we walked up a gentle slope of grassland. 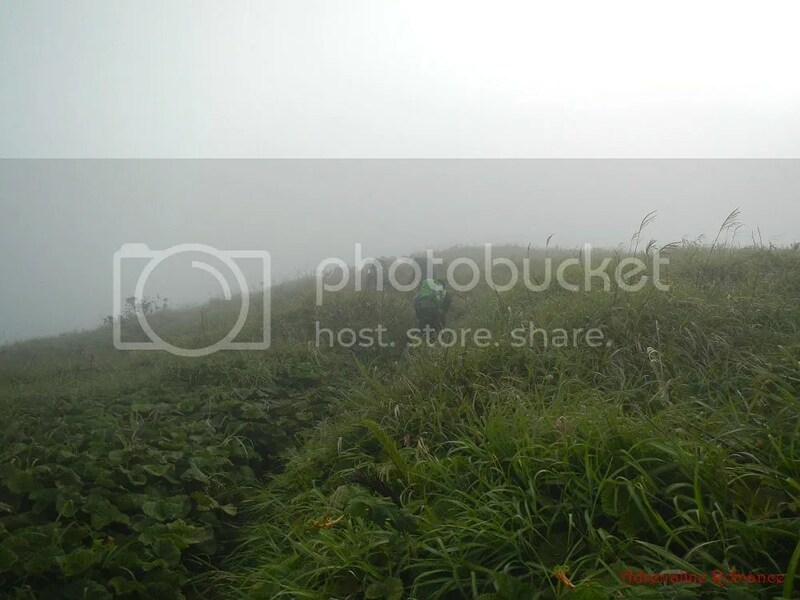 We were still quite disappointed though that the fog was still thick; it never let up since we arrived at Makawiwili Peak. At last, at around 4:00PM, we arrived at the Eastern Saddle campsite. Exhausted, we sluggishly set up our tents. The oppressive fog, unfortunately, was still there. Mountain shrubs and blossoms dot the Eastern Saddle in thick and large clumps. Then, the mountain god smiled upon us, seemingly acknowledging our efforts and welcoming us to his shoulder. The curtain of fog gradually dissipated, and the god showed himself. Mt. Kanlaon’s cone was there with all its glory. Immense! Overwhelming! Wondrous! Humbling! 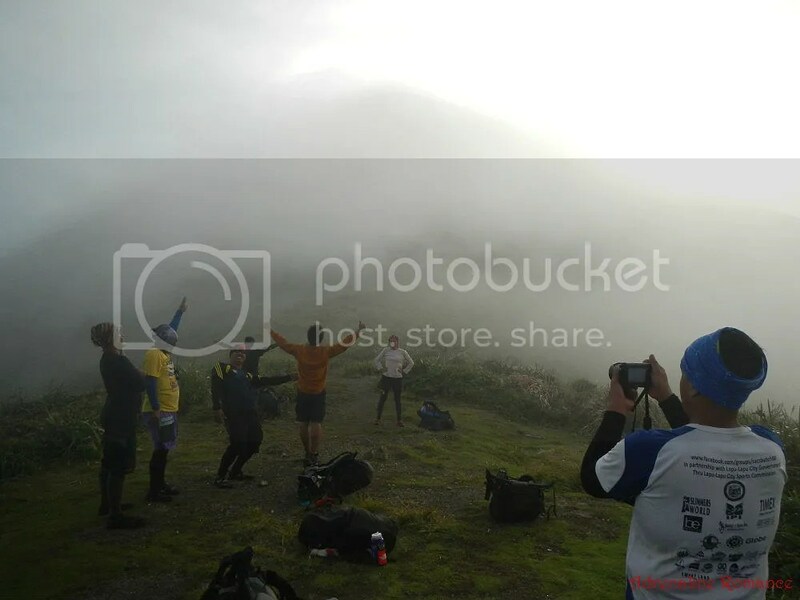 As if rewarding us for our efforts, humility, and respect, the curtain of fog retreated from the mountain, and we saw the splendor of Margaha Valley. We cooked dinner before daylight completely goes out. For our contribution, we cooked Sweetie’s very own version of carbonara using fettuccini instead of the usual spaghetti. We also used mushrooms and chorizo instead of bacon and cheese. Now, you may wonder why we’re wearing thick winter jackets. We’re wearing those because the temperature there at the saddle is extremely cold (well, at least for us). It was around 18 degrees when the photo below was taken, and the temperature was still dropping as night approached. Not wanting to be outdone, our teammates and guides prepared their own delicious viands for the celebratory feast. And boy, was it a sumptuous feast at more than 2000 meters above sea level in the middle of nowhere at an extremely chilly temperature of 15 degrees. We prepared creamy carbonara fetuccini while Sirs John, Val and Maa’m Apol served yummy tuna spaghetti. 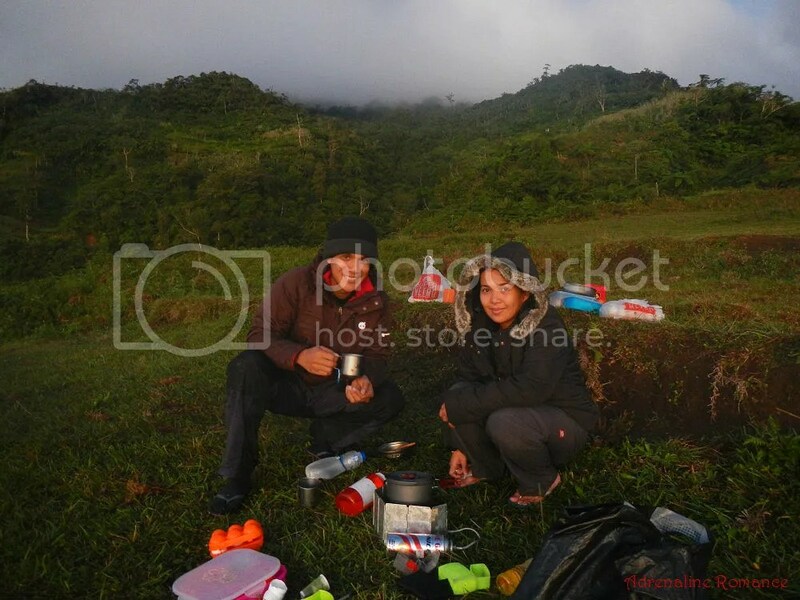 Our guides served steaming hot pochero, a very welcome and delicious soup in cold weather. Sirs John and Val also offered sweet fruit salad for dessert. Beat that, instant, ready-to-eat food! After a truly satisfying meal, Sweetie and I turned in early to sleep and contemplated on the day’s climb. We felt in our hearts that the mountain god has smiled upon us. Trek to Part 3 of this adventure. It is important to determine how much you need to spend for the most important aspects of the climb. Please find below the pertinent fees that were involved in our climb. We did not include our expenses for meals, snacks, souvenirs, tips, and other fees in this rate sheet as you may have different needs, preferences, itineraries, miscellaneous transportation, and sharing scheme from us. Note that all figures are subject to change without prior notice. Note that we purposely bloated this itinerary to make the climb unhurried, relaxing, and enjoyable. Allow a 5-minute break for each hour of climbing. For acquisition of climbing permits, please check Part 1. For a list of important tips, please check Part 3. The top picture is very sweet 🙂 . The lake is pretty shallow…around thigh deep at its deepest point, according to the guides. Yup, you can take a dip in it, but it will be really, really cold! Hehehe! That’s more like it. 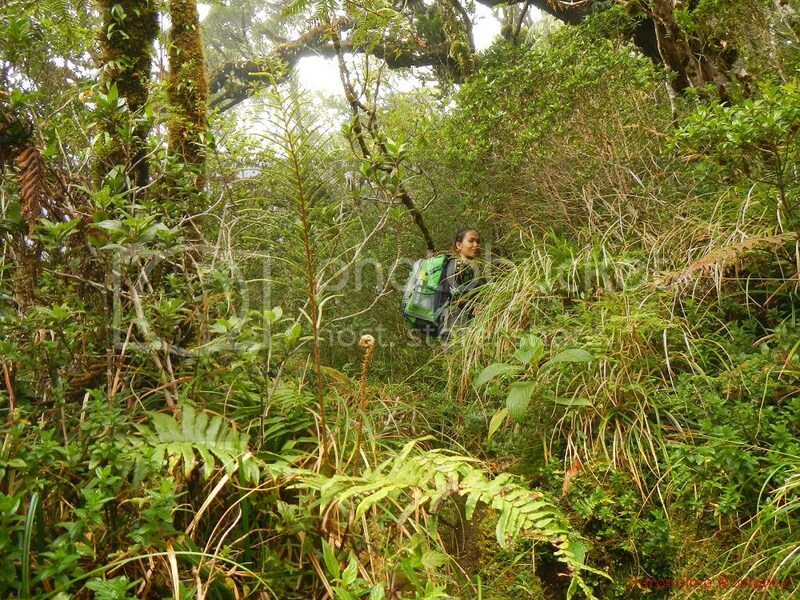 This is how a protected forest should look lie – unspoiled and untouched. Wow, grueling hike but well worth it. So you were asked why you do what you do. It’s because you can, it’s because you are able to and it’s because you love doing it – whatever that may be. We are fortunate to be able to ‘experience’ your travels and adventures in the comfort of our homes. 🙂 🙂 You guys do the hard work, okay? Someday, I’d like to taste Sweetie’s cooking. Looks like she’s a great cook. Okay so now i just iinvited myself. We’re actually very happy that you “felt” and “experienced” our adventures through our blog. That is one of our goals…to let our readers feel as if they’re there with us, and to let them experience our adventures. Sure, Sweetie will love to cook for you. Hehehe! Part 3 will be about trekking to the summit and going back down the mountain. And yes, the mystery of the valley will be solved. Hehehe! more than halfway though the climb from Kutitap, Sir Tibong said it was just 180 steps more to Makawiwili peak, but I counted mine to 219 steps. So much for my child-like strides..
this is another wonderful blog! it’s such a joy reading about the adventure like this, you did more than paint a picture, it’s like being there all over again. Congrats Sir Gian and Ate Sheila! Oh yes! We definitely agree that it was one of the best climbs we’ve ever experienced. Thank you for taking part of this climb, and we hope you and the gang can join us on our future adventures! hi sir gian, ask lang ko where ta maka ask ug guide for the trip? then pwede ug dili nalang maghire ug porter? 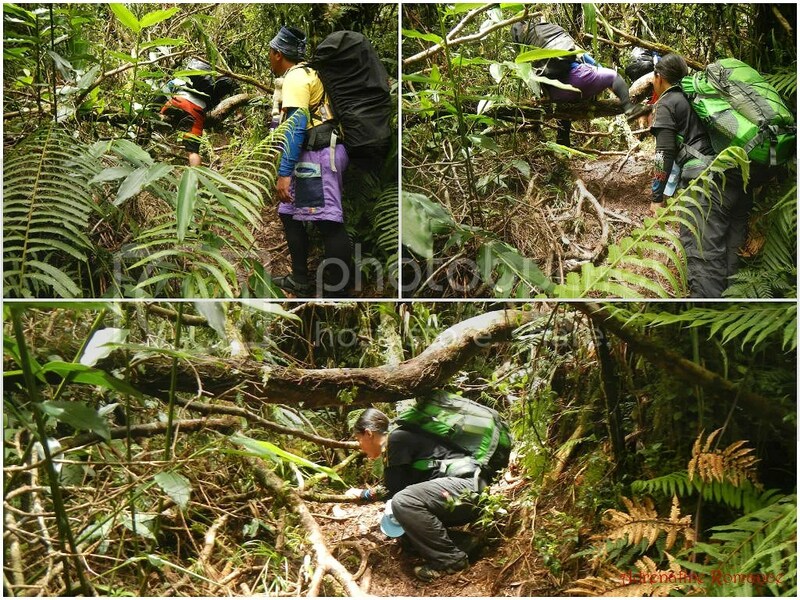 makawili trail ba ang medyo easy trail? pwede ka makarecommend ug guide sir nga dili pud mo take advantage sa price ask? 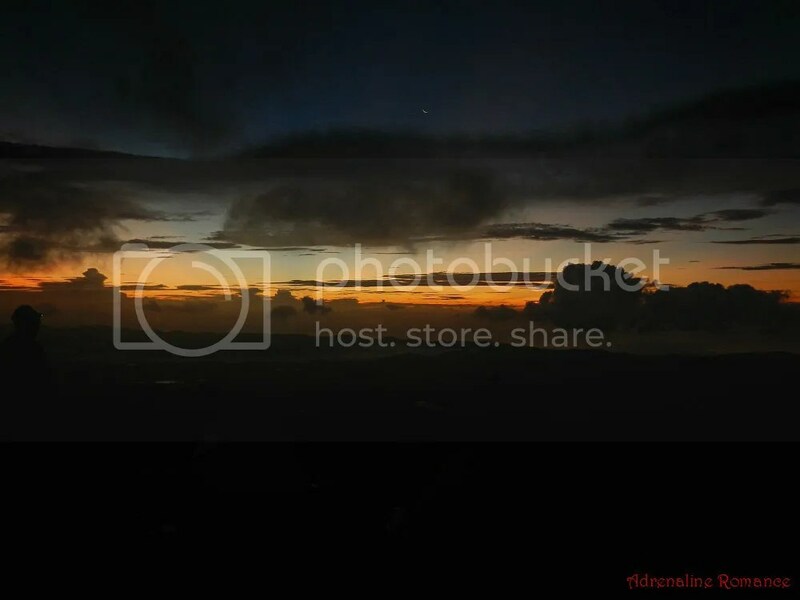 Thanks for visiting our blog. Every Filipinio mountaineer should climb Mt. Kanlaon at least once in his or her lifetime; the experience is just exhilarating. We’re glad that you’ve shown interest in climbing this sacred mountain. 1. 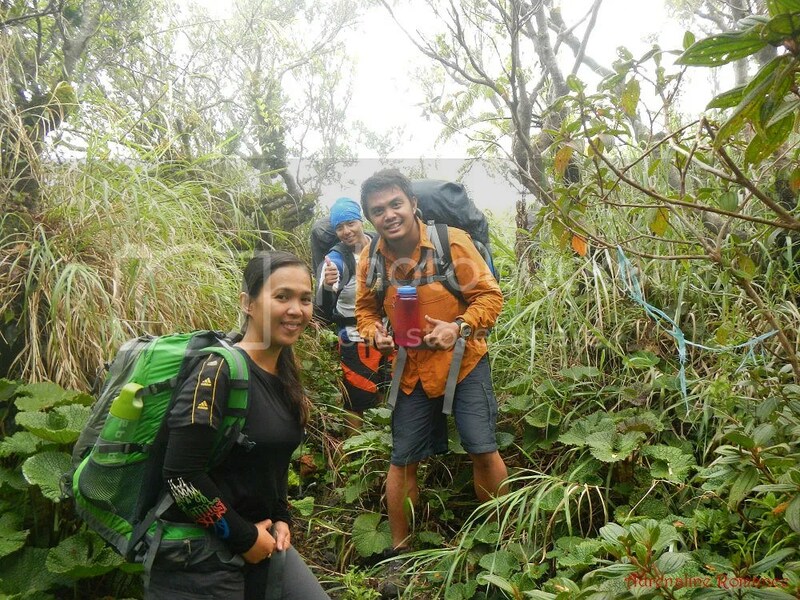 You can ask the Canlaon Tourism office for a mountain guide. Before you do that, however, you need to secure a climbing permit. For details, please check Part 1 of this series. 2. Yes, you have the option not to hire a porter; in fact, we didn’t hire a porter ourselves. 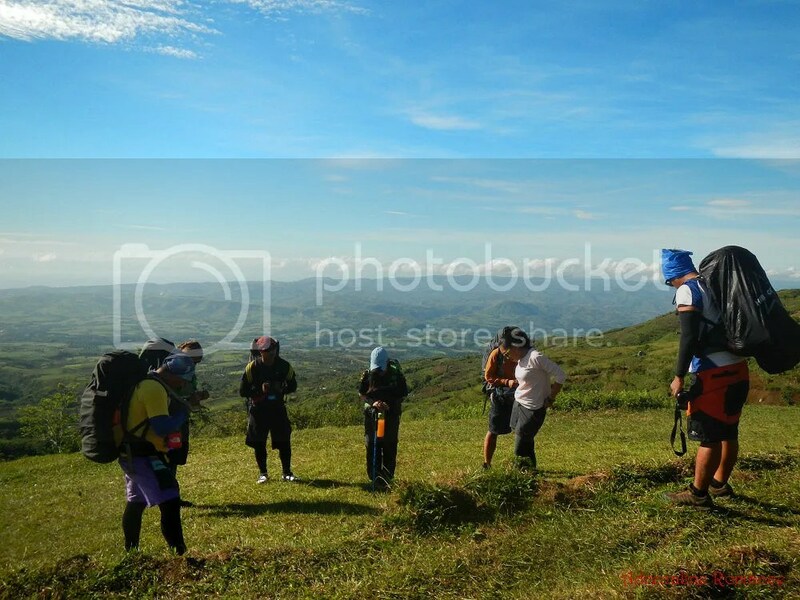 However, if your team numbers more than 6 members, you are obliged to get a guide AND a porter as per the Canlaon Tourism’s rules. 3. Trails are mostly the same in difficulty. So, we can’t say that the Mapot trail (it’s not Makawiwili trail; Makawiwili is the name of a secondary peak) is the easiest. Each of the four established trails in Mt. Kanlaon has its own characteristics. 4. The Canlaon Tourism office assigns the guide for your team. Don’t worry about getting ripped off; they are official Canlaon Tourism office guides, and the prices are fixed at P750 per day per guide (see above). It is up to you to give them a tip for their service. It looks like a great trip! And lovely photos too! If you guys like photography, we would like to invite you to participate in the next edition of our Travel Photography Competition. Every week we publish 3 winning shots on our website and write a nice bio with a link to the photographers’ websites/FB/Flickr pages. Thank you for the invitation. However, our photos were just taken from a waterproof Nikon A100 point-and-shoot. We don’t have a DSLR. 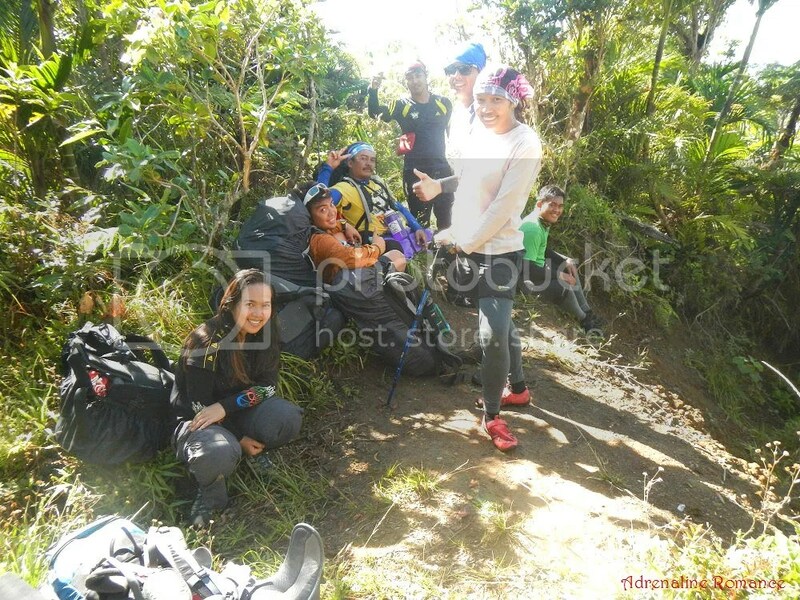 I’m a newbie mountaineer too and I’m lovin’ it since day 1. Planning to conquer the highest peaks in the country soon. 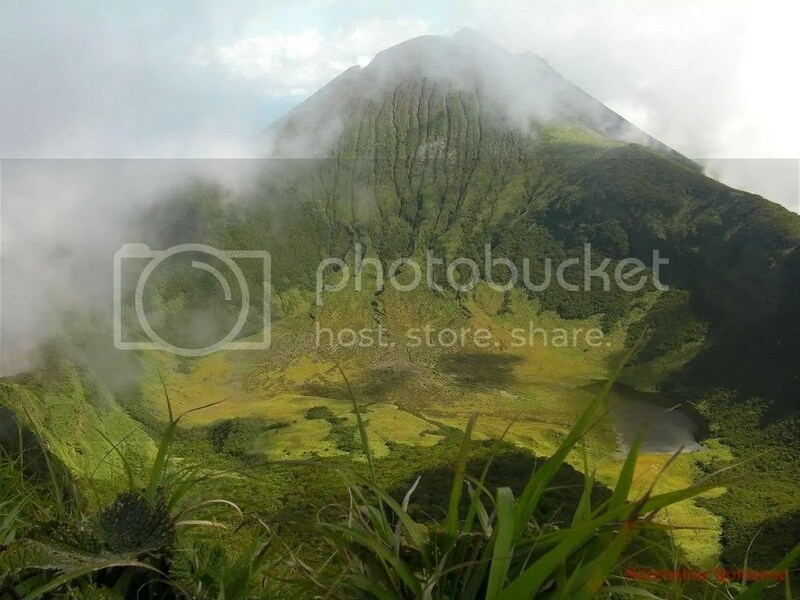 I’ve been to the Margaha twice but only summitted the active crater once….21 years ago with highschool buddies. 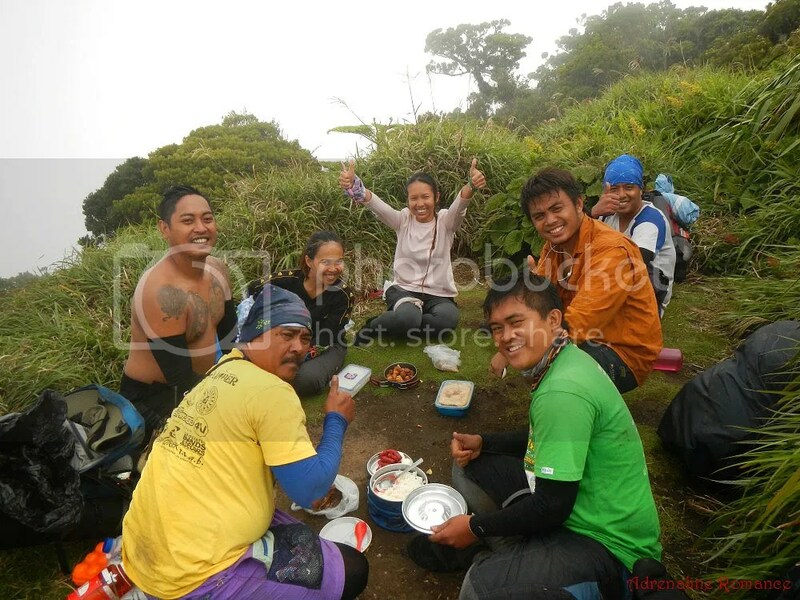 Now married with 3 kids and working 2 jobs it’s going to be a challenge by itself finding time to climb Kanlaon again. Not to mention my physical fitness . 🙂 But with your very detailed climb log/blog I now know it’s doable. Thank you very much for sharing these valuable information. Thank you very much for taking time to check out our blog. On our next climb to Mt. 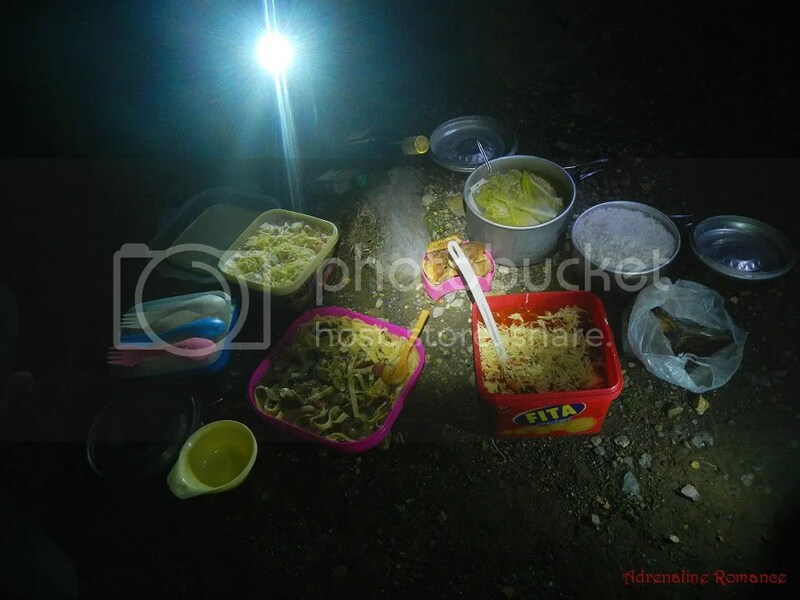 Kanlaon, we’ll camp out at Margaha Valley. 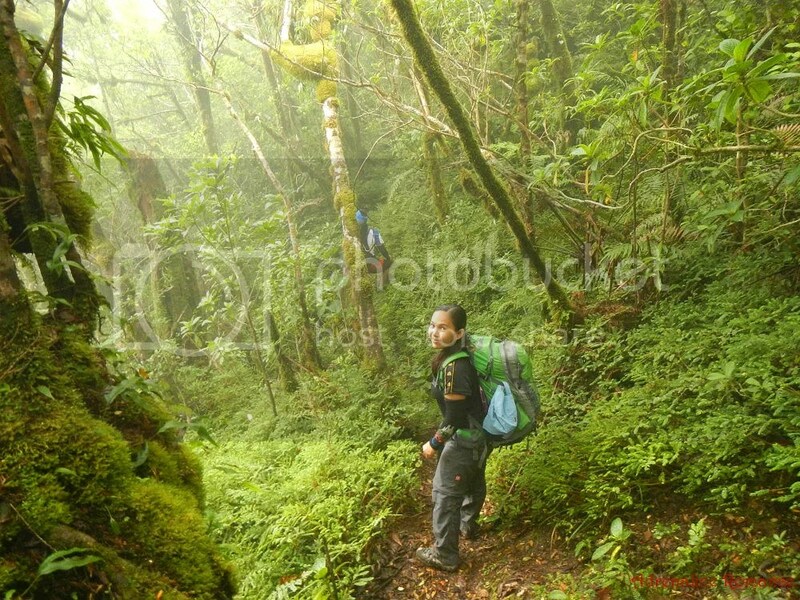 We will also try a Mananwin-Wasay traverse, which is a 4-day, 3-night trek.